Should have started this page at the beginning! There are so many interesting and wonderful ways to prepare food, its one thing the whole world has in common! Saute sliced mushrooms in olive oil until they sweat throughly. 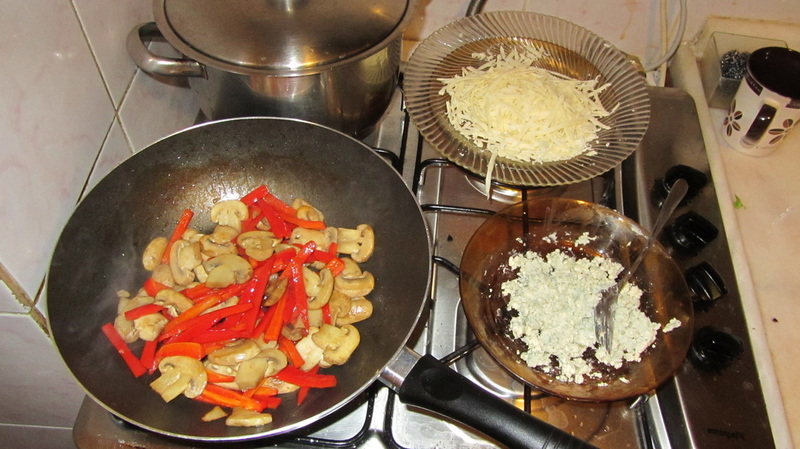 Add sliced red peppers and cook until no longer crisp (but not too soft). 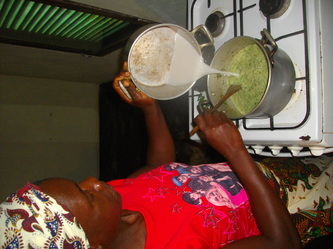 Remove mixture to separate dish. Meanwhile, cook penne (make sure to add salt and olive oil to water). Grate Kashar cheese, crumble danish blue (press with fork). 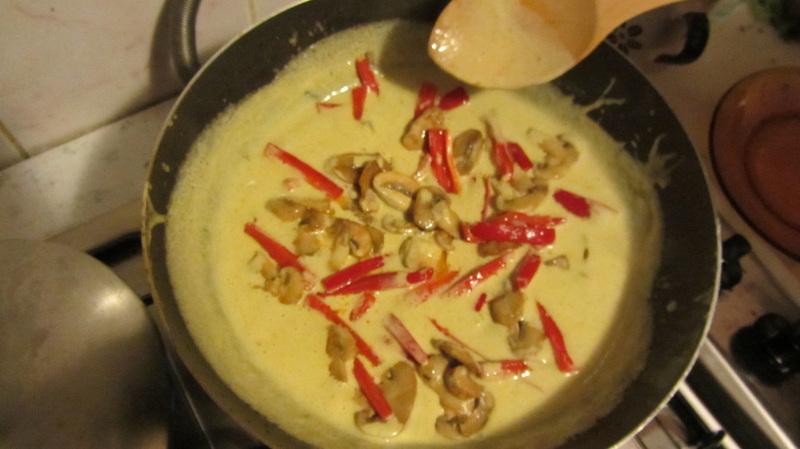 Reusing same pan as mushroom/pepper mixture, heat both types of cream and add curry powder, cumin etc to taste. 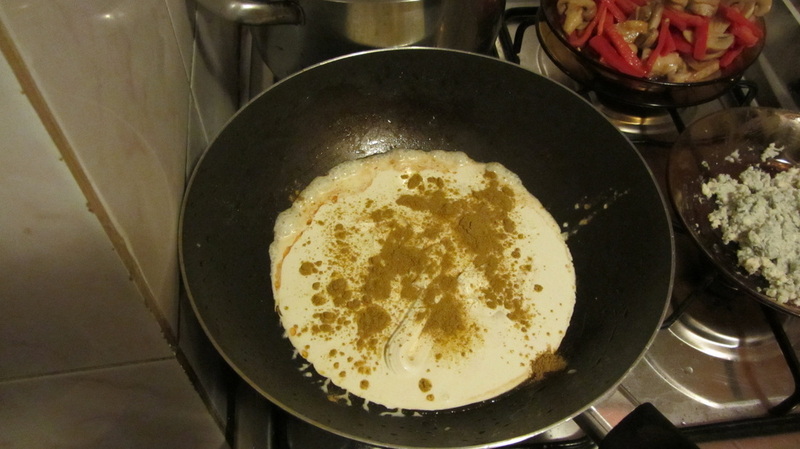 Add more hard cream until sauce reaches desired texture. Add Danish blue. Stir regularly while sauce thickens. 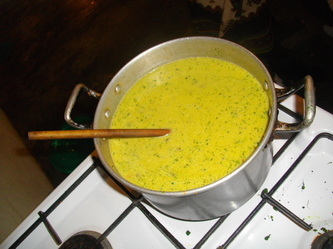 Add veggie mixture to cream sauce, stir, and let cook for several minutes. Stir cooked penne into sauce. Allow to cook for several more minutes, until penne is thouroghly saturated. 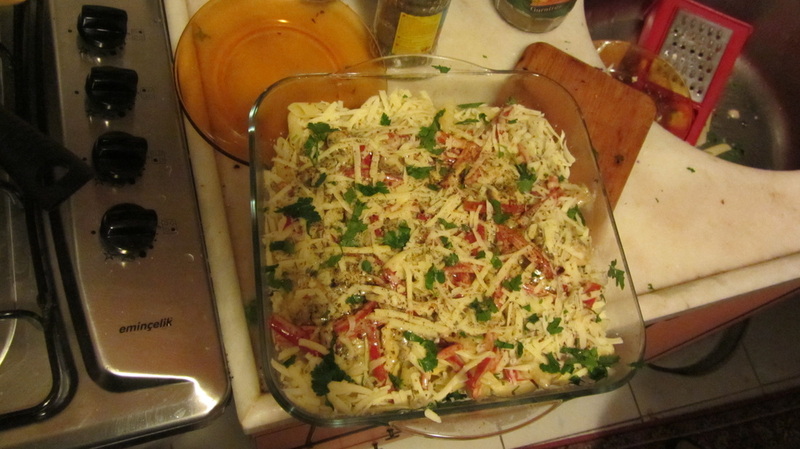 Pour pasta into serving dish, sprinkle with more spices, grated Kashar, and garnish with chopped parsely. 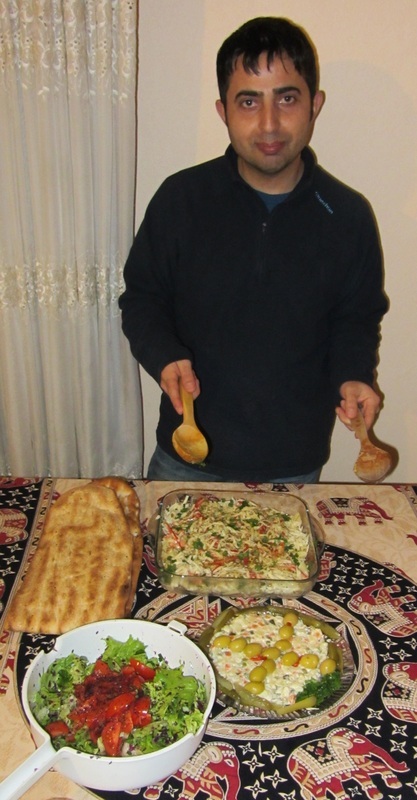 Serve with salads of your choice, and of course fresh bread - this is Turkey! Thanks Seyfi!! Maybe not traditional Turkish cuisine, but definitely very very good! Pic from biggirlssmallkitchen.com. We ate ours too fast. *Coconut Milk: yes, you can buy it in a can, but here it is always made fresh. Grate a mature coconut and boil the gratings in water for 5-8 minutes. Strain the water - coconut milk! The same grated coconut can be broiled up to three times, and the water will still be good and coconutty. 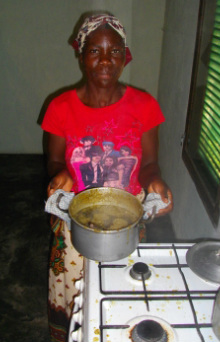 Pound cassava leaves together with garlic until they form a thick paste - in Africa all grinding and pounding is done in large mortar and pestles, but you can probably use a food processor. In a pot fry onion, then add tomato. Stir in cassava leaf/garlic mixture, then 1/2 coconut milk. Bring to boil and keep simmer over medium heat 20 minutes. Add crushed peanuts and remaining milk. Simmer an hour or more, stirring occasionally, until mixture reaches desired thickness (Peanut oil may begin to separate, that's okay). 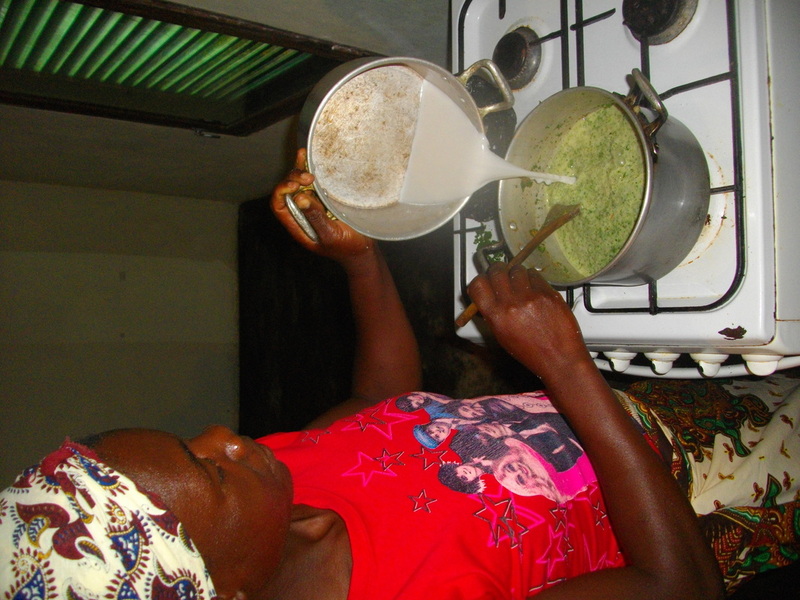 Serve over rice (especially coconut rice), shima (thick corn flour porridge), West-African fufu, or even pasta. Done! Tasty Matapa, thanks Grace! This is a quick and random recipe thrown together in Couchsurfing Jacques' kitchen with fellow Kiwi surfer Sophie. It tastes great, is hard to mess up, has variable ingredients and lots of fruit, so the "it's healthy" argument has a touch of justification. Mix ingredients, cook in greased pan. Bake halfway then sprinkle more coconut on top. Our oven had no temperature, so take an educated guess. Finish baking until golden and moist. Papaya or other fruit compote goes well on top. Ceeb au Jen ("cheb-oh-jenn") is the dish that Senegal is known for. It is unavoidable. The average family eats it at least five times a week for either lunch or dinner (or both). 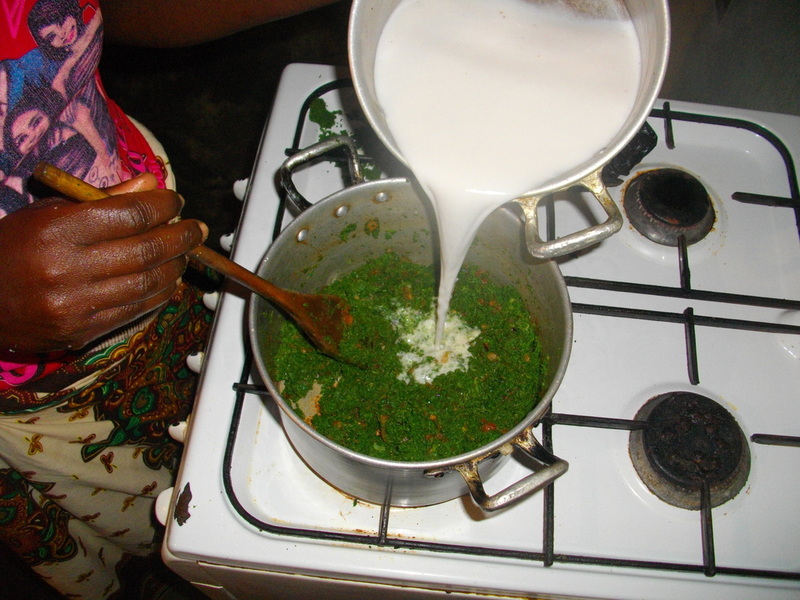 Every restaurant in Senegal serves it, and all over Africa it is popular in Senegalese restaurants. Ask a Senegalese man what he is looking for in a wife, he'll likely tell you his top request is that she can make a good Ceeb. It might take awhile to prepare, but when the whole family is sitting around a delicious platter of rice and fish, unable to talk because the food is just to darn good, you'll be happy you made the effort. This recipe is based on the one at Congo Cook Book, with a few slight modifications from my memory. 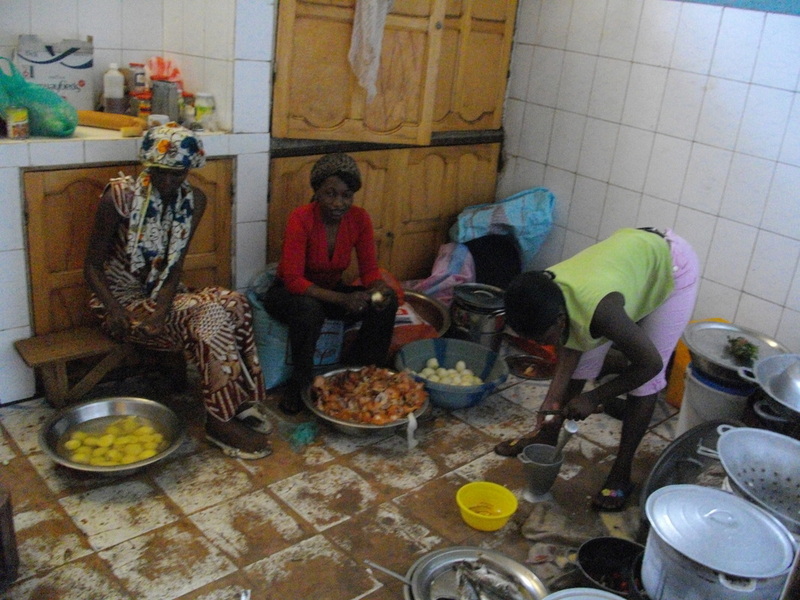 Cooking up an enormous amount of Ceep ou Jen (aka Thiebodienne) in the kitchen of the Mbodj family restaurant, in Nuakchott, Mauritania. 2 or 3 lbs of fresh, cleaned white fish - ex. halibut, sea bass, haddock etc. A delicious dish to be shared by whoever is around, no utensils needed. Picture borrowed from here. Prepare roff by grinding together in mortar and pestle until it becomes a paste - add small amount of oil if needed. Stuff into slits cut into fish. Meanwhile, steam rice by placing in a draining pot (with holes) overtop of a pot of boiling water. Cover tightly. This should take approx 30-40 minutes. Heat oil in large pot, fry onions with dried fish. Fry fresh fish for a few minutes on each side, then remove and set aside. Add tomato paste and a cup of water to pot. Add root vegetables and chili pepper. Add water to cover partially. Simmer for 30 minutes, or until soft. Add leaf vegetables to pot and place fish on top. Let simmer an additional 20 minutes. Once vegetables are soft, carefully remove from pot and set aside. Also remove a cup of broth. Add steamed rice to pot and allow to cook, without stirring, approx 20 minutes on very low heat -until tender (but not mushy!). Rice should stick to bottom of pot a little. When rice is done, turn pot over onto serving platter and scrape the slightly burned crust from the bottom of the pot on top of the other rice (this is the most sought-after part). Arrange fish and vegetables on top of rice. Garnish with lime slices. Dig in and enjoy! Many great memories of this dish!